Many people visit Lees Ferry, for several reasons; this tiny settlement beside the Colorado River is the starting location for raft trips down Marble Gorge and the Grand Canyon, the end point for the 38 mile hike through the narrows of the Paria River, it has a scenic campground, and lies at the center of a varied geological area with balanced rocks, badlands, narrow canyons and the high Vermilion Cliffs. One lesser known attraction is the Spencer Trail, a 2 mile route that climbs to a plateau above the steep cliffs of Kayenta and Navajo sandstone that border the north side of Lees Ferry, giving excellent views south down the river and northeast across Glen Canyon towards Page and Lake Powell. The path gains 1,600 feet elevation so although fairly short the hike is quite strenuous; the round trip takes 2 to 3 hours. For a longer excursion, a less used and unmarked route down the cliffs (the Dominguez Trail) may be reached by heading northwest on top of the plateau for 2 miles; it then descends into the lower Paria River gorge, which is then followed downstream back to the trailhead. All this region is within Glen Canyon National Recreation Area, hence a visit requires payment of the entrance fee, which in 2017 is $25 per vehicle. 11 views of the Spencer Trail. The Spencer Trail begins at the north end of Lees Ferry Road, just beyond the Grand Canyon raft launching area. There is plenty of parking hereabouts, also used by visitors to the Lees Ferry historic district, which includes three preserved buildings - known as Lees Fort, some concrete foundations, assorted iron machinery and an old boiler, used in the early 20th century during attempts to extract gold from the colorful rocks of the Chinle Formation. The man in charge of mining was Charles H Spencer who also built the nearby trail, as a means to transport coal from Utah. 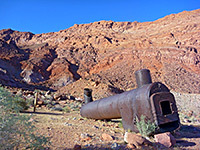 After Lees Fort, the River Trail continues another quarter mile, past a second boiler and the sunken wreck of a paddle steamship then on to the upper ferry site, right at the end of the flat land beside the Colorado, next to the start of the sheer cliffs at the lower end of Glen Canyon. The Spencer Trail forks off to the north and climbs the ever-steepening hillside, initially winding its way up a slope of large fallen boulders between which grow a few opuntia basilaris (beavertail) and other cacti. The route then has a mixture of fairly level traverses, mostly northwestwards, and short steep ascents. The path is easy to follow and well built, climbing via neat stone steps in some places, and is soon far above the Paria River canyon, high enough to see a long way south over the Colorado, as far as the Vermilion Cliffs and the first few miles of Marble Gorge. Near the top, the trail starts a long traverse back southeast, descending slightly, before the final few steep switchbacks up to the summit - the edge of a red rock plateau, marked by several large cairns. 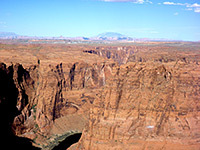 A short walk further east, over a low crest, reveals a good view of Page and Navajo Mountain, while walking a little further, down the opposite slope, reaches the adjacent edge of Glen Canyon as it curves round a tight bend. 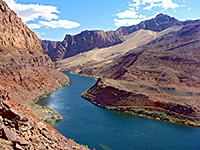 The opposite side of the Colorado River can be explored via the largely disused Echo Peaks Trail.